Angry Birds is a popular game from Rovio Entertainment for all ages that uses parabolic math to launch birds into puzzle based structures, with the goal of knocking out the green pig enemies. The game allows for engaged replay of levels as the player adjusts the launch angle, use of special bird powers that alter the trajectory mid-flight, and impact location to earn a higher score and the 3 star success. Angry Birds is familiar to most students, and real world application of it let my 3rd graders investigate physic concepts of levers and trajectory. I was inspired by examples of the game in real life and the catapults my 5th graders made last year when studying Medieval Times. Weaponry is highly engaging for students to investigate and I do think that it has a place in education when taught appropriately. 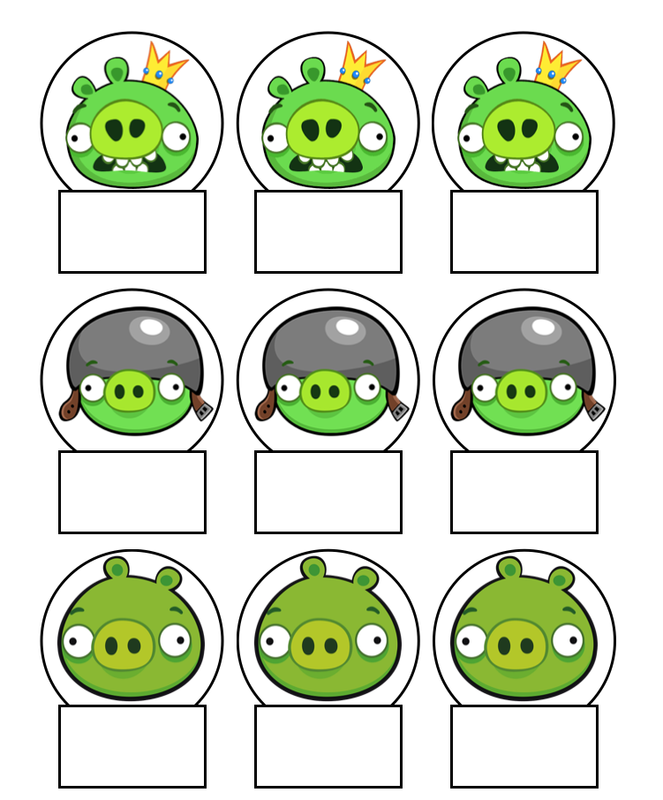 **Images of Pigs and Screenshots of Angry Birds Game are trademarked by Rovio Entertainment LTD. ArtInventionLab created the PDFs for educational purposes and makes no profit from the use or distribution of the images. Students made popsicle stick catapults with popsicle sticks, rubber bands, and a cap, with the assistance of hot glue. While I do teach my 3rd-6th graders how to use hot glue safely, for the sake of time- I pre-glued the caps for Angry Birds. There are two parts to the catapult, the two sticks rubber banded at the bottom with the cap at the top and the fulcrum, which is 5-8 sticks rubber banded at both ends. The fulcrum slides in between the first to create the lever, and is rubber banded in an X pattern. I used the imagery from Kids Activity Blog to teach my students how to make one. You can use any size popsicle sticks/wooded depressor sticks. I had large ones for the lever frame and small for the fulcrum stack. You’ll find that even highly skilled students fumble with rubber bands. I had finished students help out those at their tables as they finished steps. It helps to use 2 for the X pattern in the center, one diagonally and the 2nd for the opposite diagonal. To give me the time to help out struggling students, when a table was finished, they could go pick out 3 geometric paper forms to cut out and two pigs. Remind students not to cut off tabs! For this, I had students use tape and it helped to put the tabs on the outside of the form. The forms could be used as Level Objects to knock down and a take home to replicate play at home with the pigs and birds. I originally used pennies, but found that paper crushed balls were more effective and a way to use scraps we have from art class. Students enjoyed making size variations and borrowing game concepts from Angry Birds- such as 3 small light blue paper balls launched at once. They were also able to take these home in their paper lunch bags with the catapult, geometric paper forms, and pigs. We talked about science as a tree and the branches of Science such as Chemistry, Physics, Biology, etc. Physics is the study of motion. in Virginia, 3rd grade begins studying Simple Machines which are mechanical devices that change the direction or magnitude of a force to allow you to do more with less work. Our catapults are and example of a Lever, which uses a fulcrum to change applied force. In a catapult, the effort and load are on the same end. When we apply force on the cap end and release, the paper ball is launched. Students learn about trajectory, which is a path followed by a projectile flying or an object moving under the action of given forces. How can the position or size of the fulcrum change the trajectory of the paper ball? How does variation in the amount of force applied to the catapult change the trajectory? What else can we do to change the trajectory? With one group of students we drew out a level of Angry Birds on the board and drew the trajectories that may result from different angles. I mentioned that these curves in trajectory are mathematical parabolas, but I expect that went over their heads being 8 and 9 years old. They did understand that the path after the apex of the trajectory was going to be symmetric and mirror the rising path. I borrowed wooden blocks and foam blocks from other classrooms to help create more interesting levels and students partnered up of their own choosing. There is a learning curve to aiming with the catapult, so I didn’t put the pressure on the students to play a particular way. Once student group used a point system for knocking down color foam blocks; 10 for yellow, 20 for blue, 30 for red, and 50 for a pig to challenge each other. Using the floor was better than launching from tables and using the floor with a wall to hit the trajectories that went to far was best as students didn’t have to hunt for their birds. For a conclusion, we discussed levers, strategies used, and observations from the lesson. This entry was posted in 3rd Grade, 4th grade, 5th Grade, 6th Grade, Multiple Grades, STEAM Lessons and tagged 3D, 3D Paper Techniques, Applied Science, Critical Thinking, Cut Paper, Level Design, Simple Machines, STEAM. Bookmark the permalink.